The origin of this name is uncertain to me but I claim that it originated in the kitchen of Athai (my mother-in-law) because that's when I heard the name of it. Athai always makes idli and kadappa every Deepavali morning. The name sounded funny to me when I heard it for the first time and I have never heard anyone from my family call it by this name. Friends, please let me know if this dish is called with a different name in your household. Made with green gram, potatoes and seasoned with spices, this is a vegetarian version of a non-veg gravy made especially for idlis. Made with the right blend of spices it sure will want you to ask for an extra two or three idlis. ½ teaspoon garam masala or ( 2 cloves & small piece cinnamon). Dry roast the dhal/paruppu in a pan for few minutes ( it does not have to turn brown ) wash well and set aside. Cook separately the dhal (with turmeric powder) and potatoes in a pressure cooker. Heat about a teaspoon of oil and add the green chillies and sauté for few minutes and grind to a fine paste the coconut, fennel and the masala to a fine paste. Heat some oil in a kadai/pan and add the cinnamon and cloves, then add the onions, green chillies, curry leaves and garlic. Sauté well until the onions turn soft. Now add the tomatoes, chilli powder and salt. Sauté well until the tomatoes turn soft and forms a nice masala. Simmer for few minutes until oil starts to separate. Peel the skin of the potatoes and slightly crumble with your hands and add to the masala. Mix the dhal and coconut paste, add water if necessary. (it should be in kurma consistency ). Bring to a boil and simmer on low heat for 5 minutes. Garnish with finely cut cilantro. Squeeze juice of ½ lime before serving. I love kadappa, love your version with fennel in the grinding part.. This is very famous in our home town.. My mami makes it so yummy but makes it simple. I will try ur method with fennel next time whe I make,love the pics! I love love Kadappa. Remids me of my grandma serving this with hot idlis when ever I visit for holidays. I too make it the same way. lovely clicks. yummy kadappa!! !nice presentation n click! 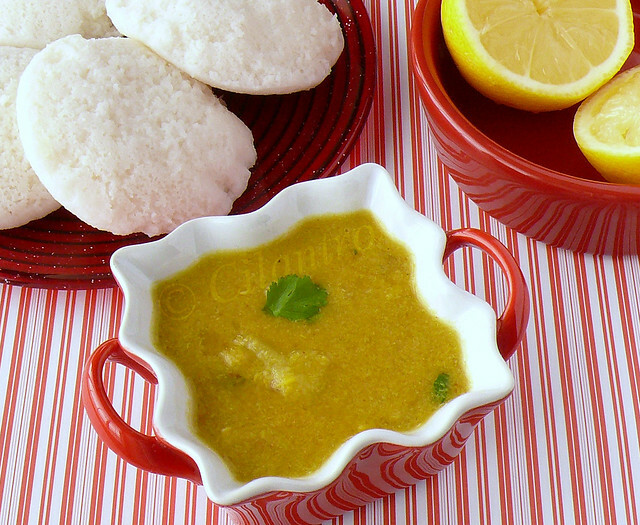 This is a definite must make - we love these kurma kind of dishes - especially to have with idli. I posted one sometime back - a restuarant style sidedish which I adapted to a non vegetarian version recently. Goes well with idlis - as this one seems as well! Reminds me of the peas masala that was served with the flaky wheat 'porotta' in some restraunts in Kerala. This looks delicious! Looks like they are made for each other this idli and kadappa. Will give it a try this weekend. My mom's signature dish, havent prepared since a long, urs makes me drool and pulling me to try soon..
delicious n tempting dish..wanna try now..
first time here..lovely space with fab recipe collections. Thanks for dropping by blog and it's a pleasure to discover yours. The recipe sounds very interesting. Shall be looking forward to your entry. this is totally new to me.. bookmarked! This name is completely new to me, and I just read why:-) The spice mix to grind sounds really good and flavorful. I love kadappa. My grandmom serves this with idly (just the way you did). Many of my friends haven't heard about this dish. Was wondering which part of Tamil Nadu it originated from? May be Thanjavur district?